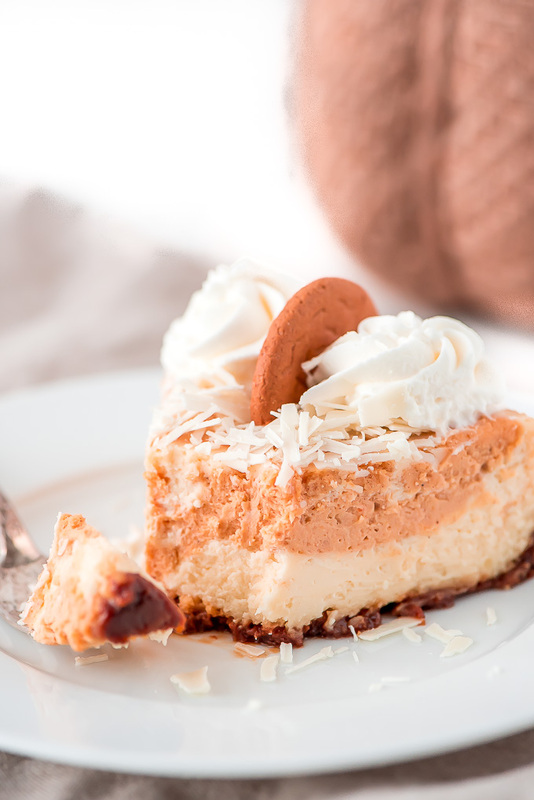 With a silky smooth texture, elegant chocolate shavings, whipped cream, and a gingersnap crust, everyone will be making room for dessert when they see this White Chocolate Pumpkin Cheesecake. If I haven’t said it enough, I’m not a big fan of pie. Actually, the pie I like the least is pumpkin. So every Thanksgiving when my mom would bring out her gorgeous homemade pumpkin pie I dished myself up a bowl of ice cream with homemade Chocolate Syrup. As good as ice cream is, I now make sure my Thanksgiving has something other than just pies. 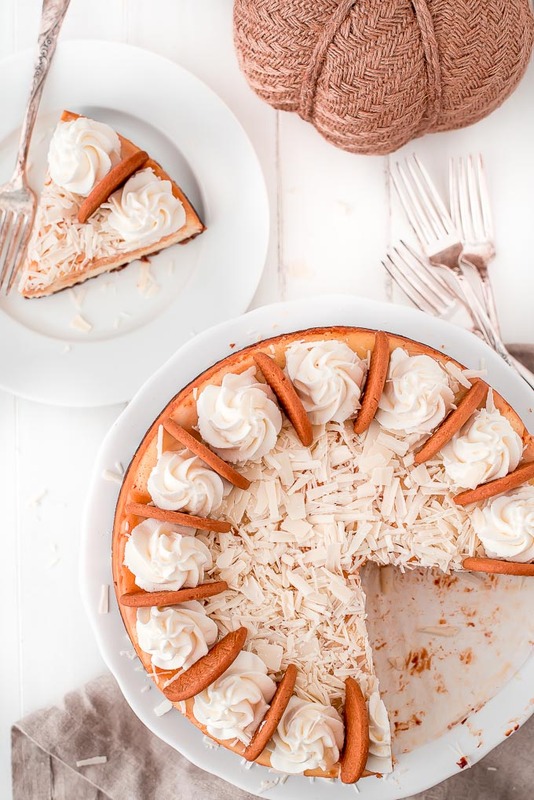 I have so many options now, it’s hard to choose between Pumpkin Cheesecake Trifles, Caramel Pecan Carrot Cupcakes, Caramel Apple Cheesecake Bars, and this heavenly White Chocolate Pumpkin Cheesecake. 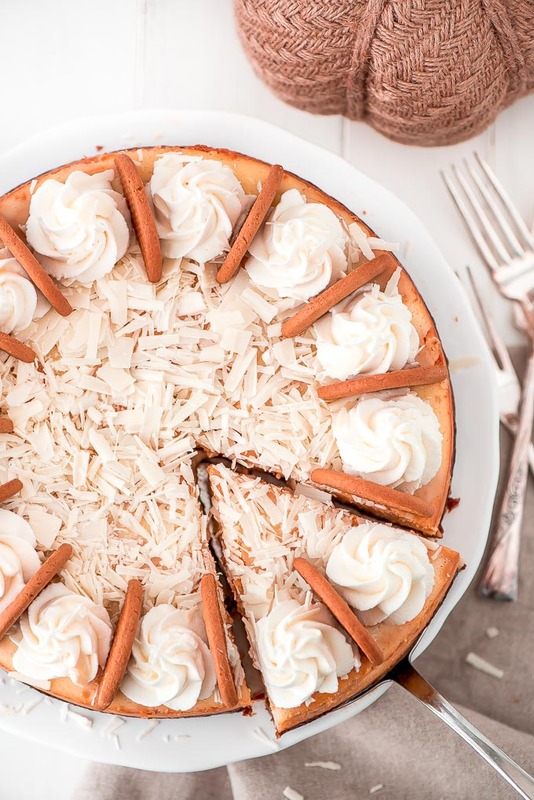 Yes, cheesecake does require a bit of work but it is so worth it! To start this cake off you grind up some gingersnap cookies for the crust and then press it into the spring-form pan. You bake it for 15 minutes while you are prepping the rest of the cake. 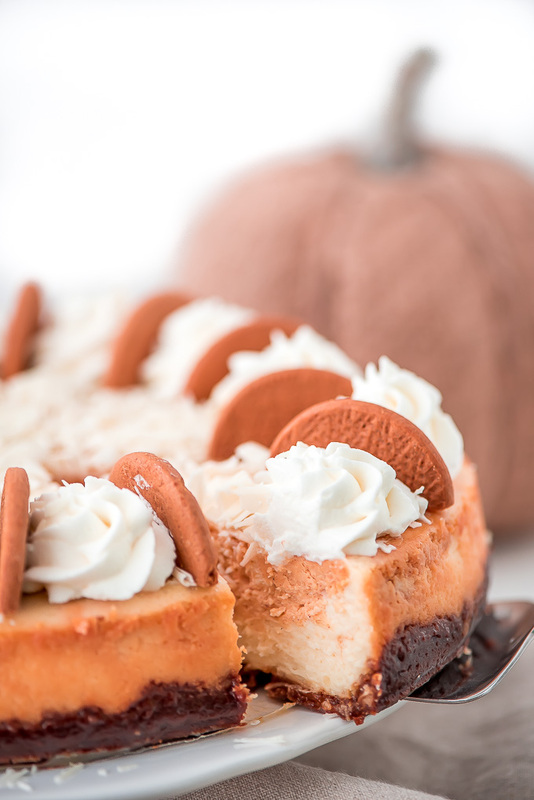 This cookie crust adds a depth of flavor that pairs perfectly with the pumpkin. For the white chocolate cheesecake batter all you have to do is mix the cream cheese, sugar, eggs, and vanilla together and then add in the chocolate that you melt with a little cream. Not difficult at all. The pumpkin batter is basically the same except you throw in pumpkin puree and some spices instead of white chocolate. Then just alternate adding the two batters to the pan. What I love about this cheesecake is that it’s cooked as if you are doing a water bath but without the risk. Before you pop the cheesecake in the oven you place one rack on the bottom of the oven and place a 9×13 inch pan on it. The other rack should be placed in the upper third of the oven. This is where you’ll put the cheesecake. 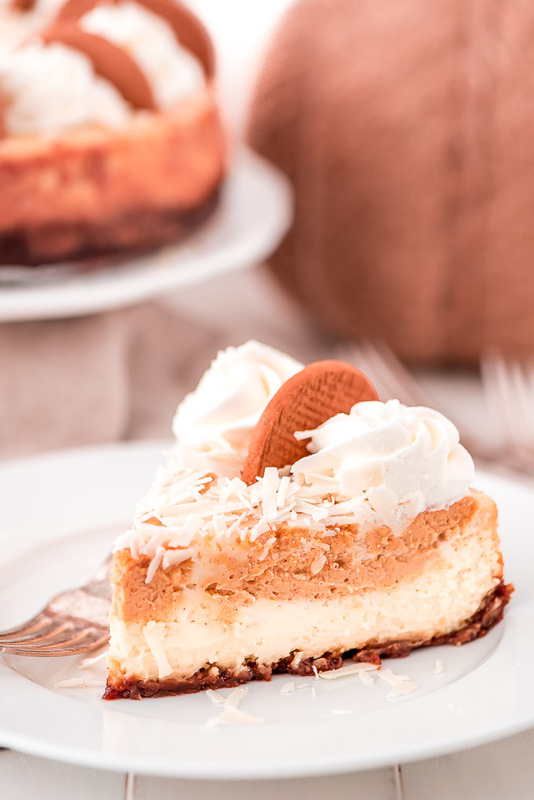 Then boil 3 cups of water in the microwave, pour it into the metal pan on the bottom, immediately place the cheesecake in the oven as well and close the door. Let the cheesecake cook for 55 minutes or until edges are set but the middle is still wobbly when you shake the oven. Once the timer goes off, don’t open the oven. Just let it sit for and hour to slowly cool down and then allow to cool fully before placing in the fridge. Cooking the cheesecake this way creates a flat even surface on the top without cracking. You will get cracking if your batter if over mixed. To avoid that from happening, make sure your cream cheese and eggs are completely at room temperature. I recommend leaving them on the counter for at least 4 hours before making. But if your cheesecake does crack, it isn’t the end of the world. 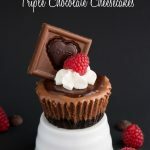 It will be covered in chocolate shavings! 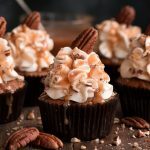 You can make these by using a peeler or by melting the chocolate and pouring it on the back of a baking sheet and using a spatula to push off the hardened chocolate. 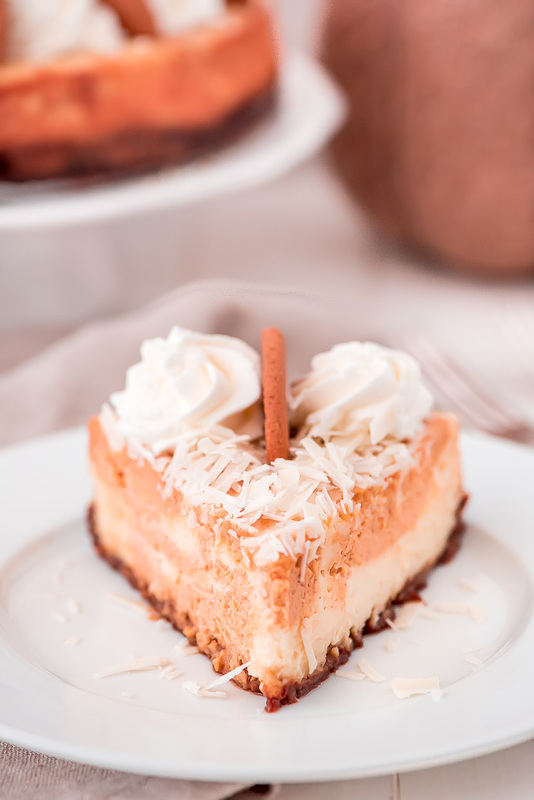 Seriously guys, this White Chocolate Pumpkin Cheesecake is the bomb! Don’t even bother making pie. This is like 876 times better. Place one oven rack in the upper third of the oven and one rack on the bottom. Place a 9x13 metal pan on the bottom. Preheat oven to 300 degrees. Line the bottom of a 9-inch spring-form pan with parchment paper. In a food processor or blender, blend cookies into crumbs. Add sugar and butter and blend until combined. Empty into the bottom of a pan. Spread and firmly press crumbs down and a little up the sides. Bake for 15 minutes. Place chopped chocolate in a bowl with the half and half cream. Microwave at medium power for 30 seconds at a time, stir, and heat another 30 seconds. Mix until all chocolate is melted and smooth. Let cool for a few minutes. Using an electric mixer, blend the cream cheese until smooth. Mix in the sugar and then one egg at a time. Mix in the vanilla and then the melted chocolate. Set aside. Using an electric mixer, blend the cream cheese until smooth. Mix in the sugar and then the pumpkin puree and spices. Mix in one egg at a time until combined. Pour large dollops of alternating batters side-by-side, in one layer and again for a second layer. Used a knife to swirl layers together. Heat 3 cups of water to boiling. Pour the water in the pan that is in the bottom of the oven and then immediately place the cheese cake on the upper rack. Bake for 55 minutes. Turn off the oven, let it sit in there for 30 minutes, then crack the door about 1 inch and let it sit in there for another 30 minutes. Remove from the oven and allow to cool completely before refrigerating. Refrigerate overnight. Run knife along edges of pan and remove side of pan. Slide a long metal spatula under the parchment paper and remove cake onto serving platter. Add toppings, slice, and serve. 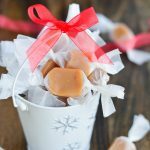 Whip powdered sugar and cream together until stiff peaks. Place in a piping bag and pipe onto the edges of the cake. 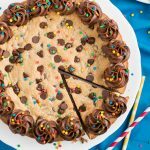 Melt the chocolate, pour onto the back of a cookie sheet and spread as thin as possible. Place in freezer for 1-2 minutes until you can touch it without leaving a finger print. Use a metal spatula to push the chocolate off and create shaving.